Brooke Trapnell, the runaway bride in Save the Date, continues her story, having moved back to little town, Georgia, with her son, Henry. The resident wealthy socialite philanthropist of nearby Sea Island, Josephine Bettendorf Warrick, contacts Brooke to represent her against the state of Georgia, who wants her land for a state park. The secrets of nonagenarian Josephine slowly seep out as she lays out her plans to atone for her sins and defend her estate by passing it on to descendants of her long ago best friends. Brooke discovers a related family secret she would have never thought to guess. Andrews’ description of friendships in the 50s deep South feels less like crossing a color line and more like pushing into an invisible, flexible barrier that they can’t quite break through. 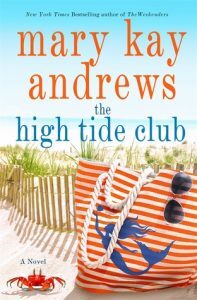 The re-emergence of The High Tide Club through the descendants of the original members is meant to be poignant, yet it’s hard to imagine the remaining original member at 95 walking naked into the ocean in chilly October. Though Andrews’ writing continues to be fully engaging, this novel seemed to go long, and it felt as though the author decided at one point to simply wrap up all the loose ends, with revelations coming fast and furious after the typical length of a novel, around 300 pages. There’s a contemporary would-be killer paralleling the murder mystery from decades past, and neither seems credible, nor true to character, even given the circumstances. Despite this, it’s an interesting story and worth it for a sandy good beach read. I was fortunate to receive a pre-release copy from the publisher of one of my favorite authors.